Satucket Lodge, from 1881 to the present. Wampatuck Lodge, from (unknown date) to the present. 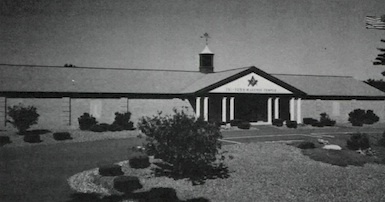 05/16/1982: 1982-53; Hall dedication (Tri-Town Temple), at a Special Communication. 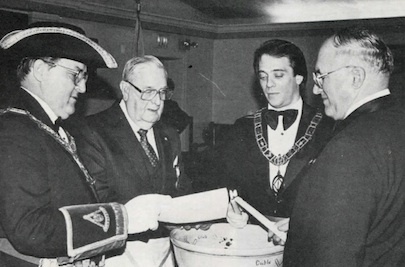 Most Worshipful Albert T. Ames, Grand Master of Masons in Massachusetts, led a large delegation of Grand Lodge officers together with many distinguished Brethren to East Bridgewater to assist the local Brethren in "consigning to the flames" the mortgage of the five-year-old Tri-Town Masonic Temple. The Grand Master's suite was composed of some 25 Grand Lodge officers from around the jurisdiction. Honored to be taking part in the ceremony were: Bro. Wesley D. Blake, a 60-year member of Puritan Lodge; Wor. James D. Paiva, P. M. of Wampatuck Lodge, representing younger Masons, and Bro. Norman Shepherd, chairman of the mortgage-burning committee. During the burning of the mortgage paper a ceiling heat detector sounded a shrill warning, which prompted the Grand Master to remark, "It's nice to know that the fire alarm system is in good working order." The ceremony followed a potroast dinner served by the ladies of Wampatuck Chapter, Order of the Eastern Star, of Hanson. The Grand Master, Bro. Wesley D. Blake, Wor. James D. Paiva, and Bro. Norman Shepherd. This page was last modified on 11 October 2016, at 20:55.